Medford resident Anthony Mongeluzo was honored with Goodwill’s coveted Helms Award. 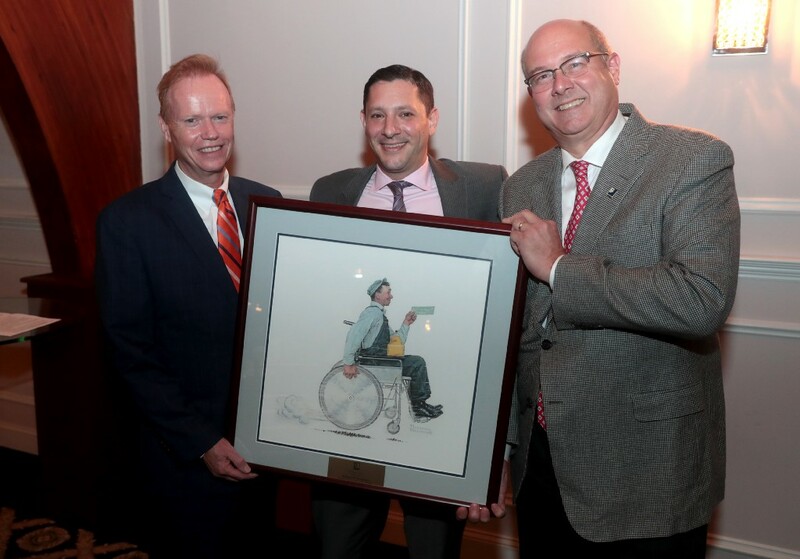 The award presented was a framed Norman Rockwell print depicting a man in a wheelchair receiving his first paycheck from Goodwill. Goodwill Industries of Southern NJ & Philadelphia recently celebrated another year of successfully turning on the power of work for local residents with disabilities at its 2018 Awards Reception, which took place at The Marian House in Cherry Hill. At the event, Medford resident Anthony Mongeluzo was honored with Goodwill’s coveted Helms Award for his entrepreneurial spirit and outstanding philanthropic contributions to the community. Mongeluzo is the president Pro Computer Services (PCS) based in Moorestown. He founded this IT firm at age 20 at his parents’ home in 2000. Today, PCS operates in six states, has more than 100 employees and services companies ranging from small businesses to large corporations with more than 25,000 employees. It one of the fastest growing IT firms in the country. Mongeluzo’s passion for helping young entrepreneurs become successful through mentoring shines through from his involvement with the Entrepreneurs’ Forum of Philadelphia and Rowan University’s College of Business Alumni Board. He was also the first to receive Rowan’s Distinguished Young Alumnus Award. Currently, Anthony serves on the Executive Board of the Philadelphia Chamber of Commerce. Through PCS, Anthony has contributed more than $250K to local community organizations including Robin’s Nest, Legacy, the Wounded Warrior Project, Durand Academy and The Food Bank of South Jersey. According to Goodwill Industries of Southern NJ & Philadelphia Mark B. Boyd, also of Medford, Anthony Mongeluzo believes in giving back to his community and to his profession. “His entrepreneurial spirit and quest to make our community a better place to live and to work is evident in everything he does,” said Boyd. Proceeds from the 2018 Goodwill Proud Awards Reception fund The Helms Academy. Here adults 18 and older can earn their high school diploma 100 percent tuition free.